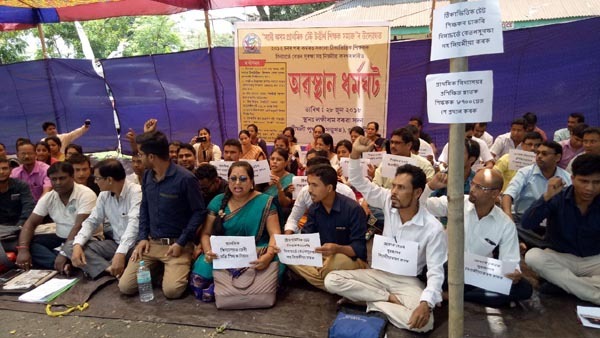 The Sodou Asom Prathamik Tet Utirna Sikshak Samaj on Thursday staged a sit-in demonstration at the Lakhidar Bora grounds in Guwahati to demand all contractual teachers from 2012 be given appointment. Himanta Biswa Sarma was the Education Minister under Congress Government in 2012 in Assam. The protestors also demanded that salary should be given to them without any conditions, and Rs 8700 grade pay to the graduate teachers of lower primary. The protestors also demanded the Government to provide maternity leave (Child Care Leave). The executive president demanded to the Government to release arrears of one year, under 7th Pay Commission. The protestors shouted slogans like Education Minister Hai Hai, Chief Minister Hai Hai, Assam government Hai Hai, No politics with Us etc. TET passed contractual teachers of lower primary and upper primary across the State joined the protest. The protestor further demanded that the State Government supply text books and uniforms to the schools in time. General secretary Deeparnab Ghose alleged that the Government has been conspiring against regularizing jobs.